Khadro-la in New Zealand, April 2014. Photo by Carey Aburn. 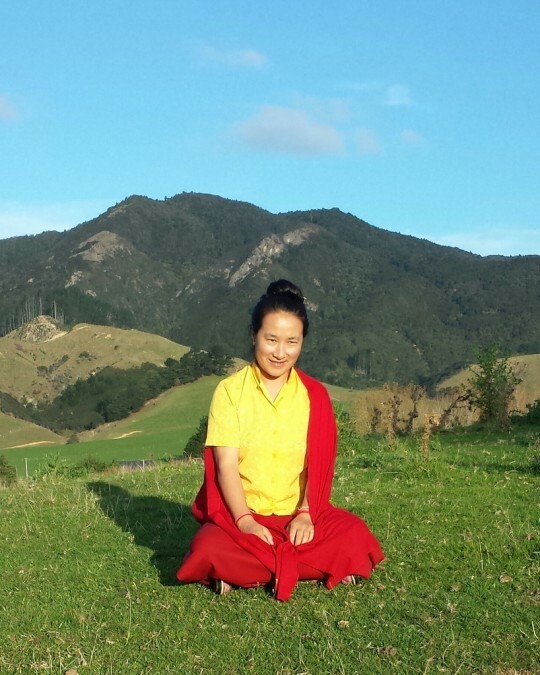 Mahamudra Centre, an FPMT retreat center in Colville, New Zealand, hosted an eight-day lam-rim retreat with Khadro-la (Rangjung Neljorma Khadro Namsel Drönme). The well attended retreat, which ran April 27-May 4, was described as “extraordinary” and “beyond words.” Ven. Nangsel, Mahamudra Centre director, shared with Mandala highlights from the retreat. From the beginning, students quickly realized we were experiencing something rare and special when Khadro-la looked at us directly and said simply, “It’s not easy to practice Dharma, is it!” From there she took new and old students alike in hand, giving many examples of how as students we go astray in the practice of the Dharma, practicing for the material comfort of this life – food, clothes and good reputation – and endlessly engaging in practice, performing rituals, our commitments and mantras without any real understanding of what we are doing. Khadro-la was crystal clear: Dharma is about mental transformation, and if we are not experiencing positive results from our practice, looking to the Dharma for shortcomings isn’t the answer. Instead, we need to recognize the negativity associated with self-cherishing and self-grasping and see the faults in our own attitudes. 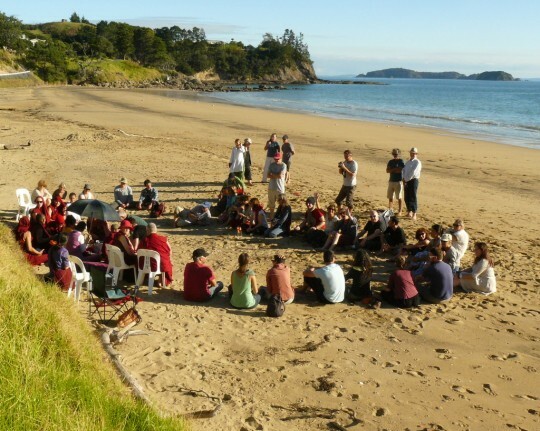 Khadro-la teaching during the retreat at Mahamudra Centre, Colville, New Zealand, April 2014. Photo by Christian Bale. Khadro-la emphasized we must use our human intelligence as prayer alone is not enough. Khadro-la taught about the importance of taking time to take refuge properly, the essential role and importance of the guru, impermanence and death, karma, suffering, bodhichitta and emptiness. She exhorted us to identify what are mistaken states of mind and what are unmistaken states of mind and be able to distinguish between the two. Students need to know how negative mind states trigger confusion, what their results and functions are, and how they give rise to suffering for the self and others. Without this understanding, Khadro-la emphasized, it is impossible to generate realizations. It is crucial to use our human intelligence through contemplation and meditation to cultivate the basis for the realizations, she said, and to strive to purify negativities and obscurations and to accumulate vast amounts of merit. By realizing emptiness and how the mind and phenomena truly abide, then unmistaken behavior, imbued by love and compassion and honesty, will naturally arise. 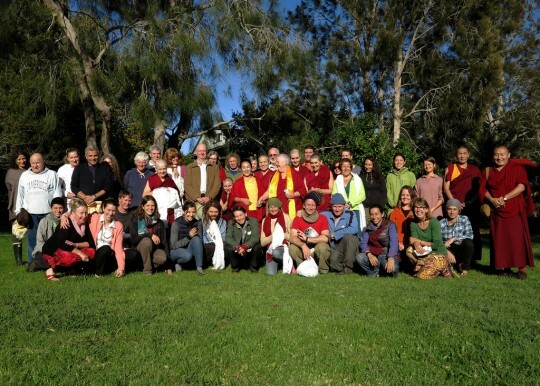 Khadro-la with retreat participants, Mahamudra Centre, New Zealand, May 2014. Photo by Christian Bale. Students were captivated by Khadro-la’s teachings and her blend of humor and directness, which cut through our excuses and misunderstandings. Students were moved to the depths of their hearts. They said things like, “I thought I was practicing Dharma all these years, but really I had no idea.” We were seeing our mistakes and faults, shown to us in such a way that we were inspired to listen intently to what we must do. At the end of the retreat we experienced great joy in the Dharma and left with renewed faith, inspiration, devotion, understanding, a strong determination to eliminate self-cherishing and self-grasping, and to engage in practice from the heart with the truth, honesty and perseverance Khadro-la was so vigorously exhorting us to do. At the conclusion of the teachings, students thanked Khadro-la and sang a waiata (a New Zealander song of farewell), all was accompanied by an outpouring of our love and gratitude. Khadro-la, her translator and attendants had shown such incredible kindness to us. 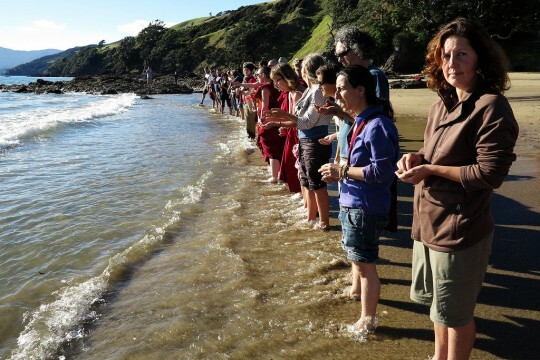 Making offerings to the beings in the ocean with Khadro-la, New Zealand, May 2014. Photos by Christian Bale. The last afternoon, Khadro-la invited us to make offerings to the animals in the ocean at Waititi Bay, followed by a picnic. It was such a lovely afternoon. In the evening we did Guru Puja with tsog. At the end of the puja, Khadro-la spontaneously broke into song. Again it went straight to our hearts, many of us moved to tears by the beauty of her song. I didn’t know what it was then, but Claire Barde, the translator, later told me it was Chöd. Vajra Cutter Sutra recitation with Khadro-la, New Zealand, May 2014. Photo by Christian Bale. We have been utterly and completely blessed and will remember this for the rest of our lives. 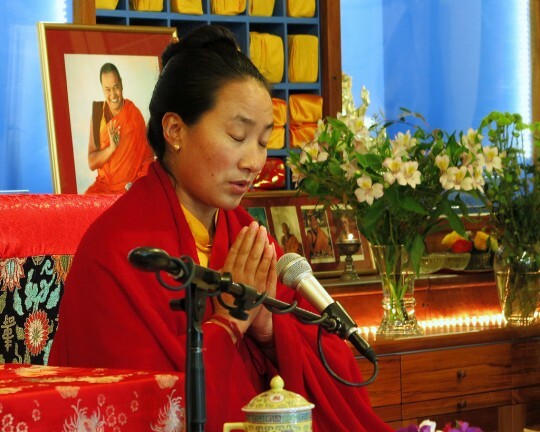 Khadro-la told us that “[Mahamudra Centre] is very beautiful and favorable for retreat – one of the best places for retreat” and indicated several times that she will return to Mahamudra Centre in the future. How wonderful! We hope when the time comes that you’ll join us! 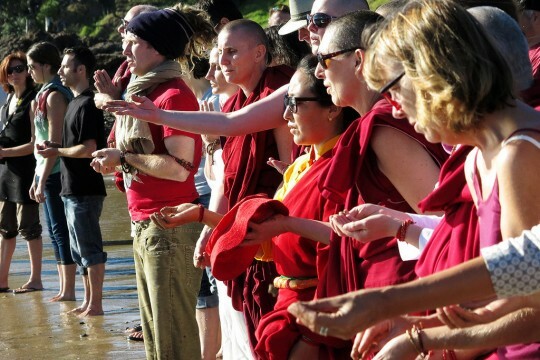 You can learn more about Mahamudra Centre by visiting their website.